The Stokes Select Giant Combo Screen Feeder attracts the widest variety of birds, providing them options to feed in their most natural positions, whether clinging to the screen or sitting on the perches or tray, even upside-down! The Giant Combo has 2 large feeding compartments, together holding over 10 lbs. of seed! Built-in drainage holes help to keep seeds dry, while the seed diverter design keeps seeds moving into feeding areas. Many favorite backyard birds love this feeder, including Cardinals, Nuthatches, Chickadees, Finches, Woodpeckers, and more. One of our top selling feeders, the Giant Combo is perfect for bird enthusiasts who want to attract a wide variety of birds. Great Item! 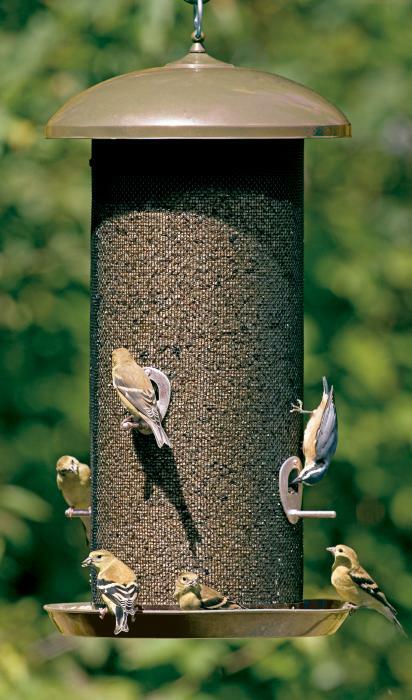 The mesh body allows more birds to feed on the seed, when the feeder perches are occupied. Wonderful gift for a bird lover.